Download the app from this website to use with Windows or Mac computer systems. Click the button on the left side that says "Available for Mac OS" or "Available for Windows". Microsoft Surface Tablet (original) is not compatible with 3M! 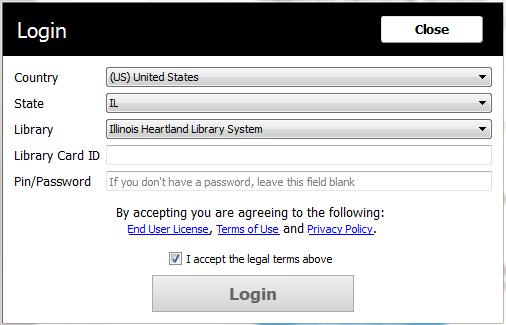 Select your library "Illinois Heartland Library System"
Select the browse button to look at popular titles, select the search button to look for specific items. Once you have found the item you want select borrow. There is a limit of five books per patron and 3 weeks per book. The ebook will return itself but you may return the book early by searching for it and selecting "return". If a book is unavailable you may place a hold on it. Select account profile and then email notification to set up email notifications for digital titles you are waiting for.